When you were in school, did you ever put off studying by getting your work area just so? 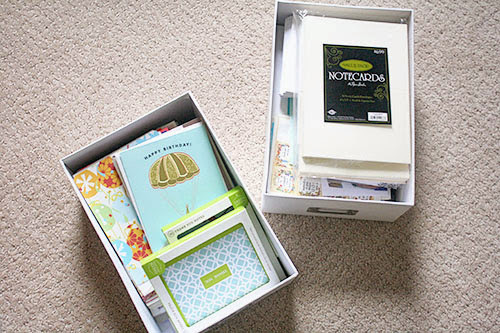 Or re-organizing your desk at work instead of tackling a huge writing project with a looming deadline? Probably, since it’s a common procrastination technique. “Oh, I can’t possibly start until I have a green pen, right now I only have red and blue pens and I’d really just do a much better job if I had a third pen color, so I’d better just go to Target now, and I guess I’ll buy groceries while I’m there too or else I’m just not being productive.” Et cetera, et cetera. Well. Now that I have a heck of a lot of (well-deserved! heartfelt!!) thank-you notes to write, guess what I’m doing? Oh hey! 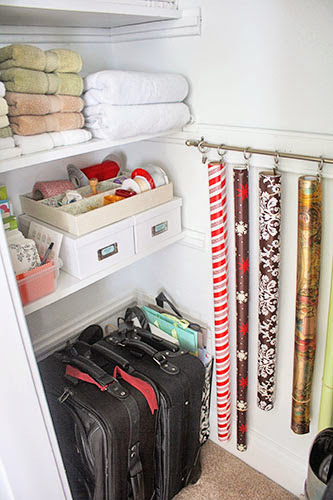 That empty space in our linen/coat closet would be the perfect place for a little gift-wrap/card-writing station. I can’t possibly start writing those thank-you notes until I consolidate all of my gift wrap and cards and stamps into a single, aesthetically pleasing nook. In my defense, the card-writing situation has been something of a mess since moving here. I created a functional (even if not very pretty) space once upon a time in our old house, with all the gift wrap in one place, and all the cards in another. 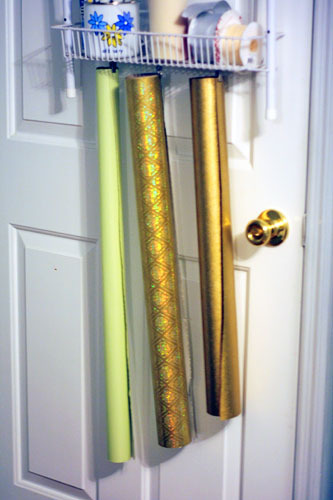 But when we moved into this place, I simply hung that modified gift wrap on the back of another closet door (not a great use of space) and then... let it fester. Then the boxes of cards got shoved onto the shelves in the nursery until they were displaced by the crib, never to be organized again. So while this wouldn’t constitute a complete organizational crisis that had to be resolved pre-baby... it had been annoying me for years now. I’d become so disorganized that those things no longer fit in the boxes I originally corralled them in. 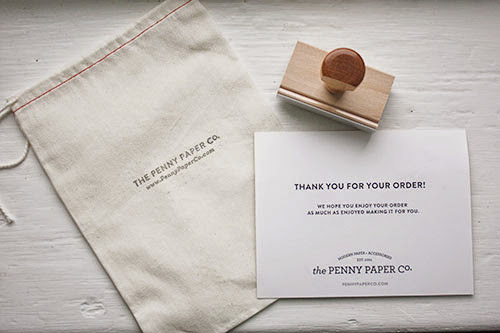 As motivation/incentive, I also had this address stamp made by Penny Paper Company. I’ve been wanting one forever (even in our old house! ), but always figured we’d move so why even bother. But when she ran a sale last month, I reasoned that I could finally allow myself this little luxury to get out thank-you notes, Christmas cards, and baby announcements. Besides, I’m a longtime fan/reader of Lindsay’s blog (remember when I totally ripped off her RAST nightstands? ), so it seemed like a great idea to support her shop. I’d love to show you more of the stamp, but since I’d have to blur out 95% of it, you’ll just have to take my word that it’s everything I hoped it would be! After sorting and organizing all the card-sending whatnots, I turned my attention to the gift wrap. 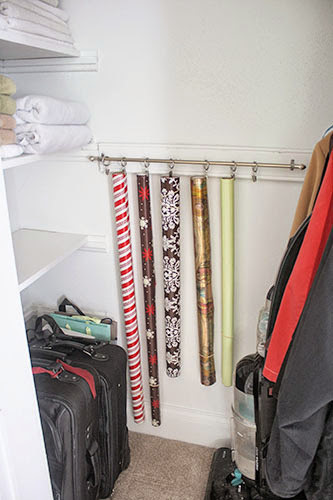 I had already gathered all my gift boxes and bags in a single reusable grocery bag and moved it to the bottom of this closet, but the gift wrap itself needed a better storage solution. I solved the problem with an inexpensive curtain rod and some ring clips I already had. Since I screwed it into a wooden support, it holds a lot more weight than the plaster walls – no worries about everything crashing to the floor and taking the plaster with it! Sorry for the not-great photos... it’s been raining in STL for a few weeks now, and this is a dark closet (especially when I stand in the doorway to take the photo)! 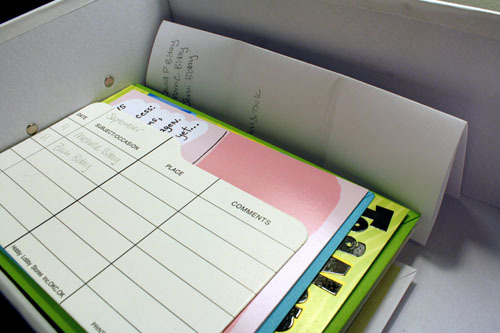 Still, hopefully you can see that I even labeled those boxes with a bit of extra scrapbook paper. You guys, that’s something I’ve been meaning to do since I tried labeling them with paint chips. Holy moly, that was a long time ago. At least it’s finally done now! 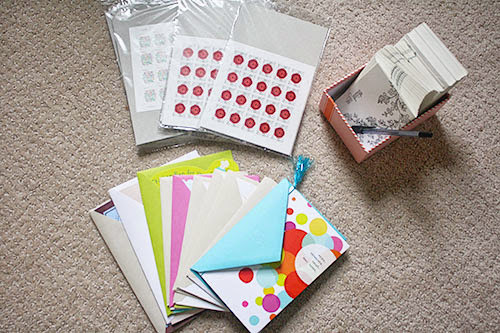 The rest of the cards aren’t tucked away in a box – I left this year’s round of birthday cards and thank-you notes out with the stamps for easy access. 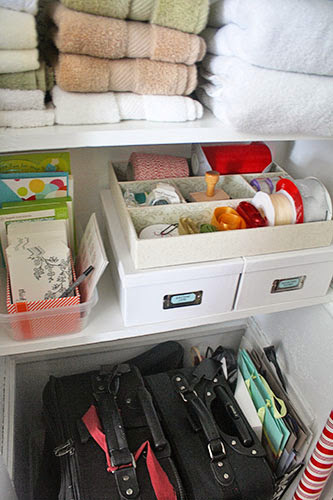 But they’re still all organized, which makes me and my overwhelming nesting instincts super happy! And now, if you’ll excuse me, I have a few dozen thank-you notes to write and absolutely no more reasons not to get it done! What a great idea for the wrapping paper. I just used an old garbage can (it was clean) and put the rolls into it. All in one place but not nearly as pretty. Gotta rethink my wrapping storage. I'd say skip me when writing thank you notes. You already told me that day :) But, I want to see the stamp ha ha!